Thanks for the shout out at Intwischa, Charlie. I’m glad you like what you’ve seen so far. In my comments at Charlie’s page, I did a little bit of math. I decided to expand on it here. How Much Time So Far? So far, I have spent perhaps eight hours on this design. I started absolutely cold, with no specific plan of what I wanted to build. About half the time was spent on documentation (including explaining what I was doing and why), about a quarter just on digging up ideas, and about a quarter was spent messing with my diagrams until they looked the way I wanted them to. I got caught up in the realization that could probably get the layouts to look roughly how they would be arranged physically in play… but GraphViz can be a fickle thing when trying to get it to do a particular layout. In practice for my own use I would probably either just accept the graph as presented or redraw using another tool, once GraphViz did the heavy lifting. I could probably halve the time spent if I were just doing it for myself. I would probably have a better idea what I wanted in the megadungeon, wouldn’t have to explain for other people what I’m doing and why, and would reduce the time spent on planning maps (the graphs). However, even at about two and a half hours per graph, including supporting documentation, this isn’t so bad considering that I could, if pressed, improv a session or two off a single node from one of the more detailed graphs. Expanded and extended across the entire megadungeon graph, there are eleven nodes. This amounts to about 25 hours of prep — I don’t expect to spend so much time explaining any more, and I have more ideas going into some of these regions than I did for the two I started with. I have about three pages of documentation for each graph created so far. There are 12 such graphs, including the megadungeon, and a total of less than 40 pages of documentation. I have outlined two megadungeon nodes, with nine and ten regions each. Across the entire megadungeon this would make for between 100 and 110 areas of interest. Even if I have to improv and my players got through three such nodes a night, this is somewhere around 35 sessions. If we were to have a weekly session three out of four weeks, this amounts to almost a year of improv play, about 100 hours if each session is about three hours. Pretty good for 40 pages of notes and 25 hours of work, yeah? Let’s consider instead how much detailed material could be prepared from this. If I want to be more rigorous and fully define everything, the volume of documentation quickly climbs. Each node in the regional graphs could be similarly documented: what is the theme and campaign/scenario purpose of the region, what makes it dangerous, why would someone go there, how do you recognize it, and so on. For instance, you might go to the Dwarven Crafters node of Clockwork Hell in order to get them to teach you something or provide a letter of introduction back at the Dwarven Safehold. I could also specifically identify the areas of interest (for the Dwarven Crafters it might be their living quarters, their work area, and perhaps one or two others). At this point I would probably start identify less significant characters. Aristothanes and Shalthazard are already specifically identified, they are individually significant across the dungeon, while at this point ‘the dwarves’ has been sufficient. Across the entire megadungeon, I’m estimating about 100-110 nodes to be documented. Assuming these development notes for each comes to 2-3 pages (I can probably provide some shared definitions — the entirety of Clockwork Hell shares some characteristics, so expand that document to four pages and I can probably reduce all the others). This would add some 250-300 pages more to the total, resulting in some 300-350 pages of development notes. This finds a curious parallel to the number of ‘rooms’ that might be expected. If each node in the regional graphs consists of 3-4 specific areas of interest (‘rooms’), there could be 300-400 rooms in the megadungeon, about one page of development notes per room. These are development notes, which are perhaps somewhat expansive and include things that can be summarized in use. I expect that if I were preparing this for publication I would distil each node at the regional level to a single two-page spread (facing pages) that describes the contents of the region in a playable manner rather than a development manner. I just realized one of the things that has always turned me off about megadungeons in the past is that there tends to be either nebulous relationships between elements, or relationships are tossed out in the text and promptly forgotten. This mode of development keeps the relationships at the front of the mind while working. I digress. At two pages per regional node, 100-110 nodes would result in some 200-220 pages of actual playable material. This still leaves 30-50 pages for supplementary material such as maps (I can easily see a full-page map per regional graph), story background, and systems appendices (new monsters, spells, magic items, etc.) and still fit a 256-page book. It’d be a big beast, no question. From the descriptions I’ve seen, roughly the size of Dwimmermount. I will assume each graph or node would take 2-3 hours to develop. This is fairly consistent with observation so far, and if I get faster, that would still serve as a handy upper bound. A total of 100-110 nodes, plus 12 for the megadungeon and regional graphs, makes a total of 112-122 work units — 290 hours or so (224-366 hours, estimates are still at the +-25% stage). I have observed I can usually get six hours of mentally-focused work per day (after that I tend to flake off; good time to get my email and meetings out of the way), which amounts to 37-61 days effort. Call it 8-12 weeks, or 2-3 months of full time solo work. The improv results estimated 35 sessions of play. If each session were three hours then there would be only about 100 hours of play, the development time is inordinate for personal use. However, the expanded material means there would be sufficient detail to extend the time spent. Rather than three nodes per session (due to lack of detail) it might be one node per session. Fully exploring the megadungeon might thus require time comparable to that needed to fully detail it. This is the upper bound of time I would spend for personal campaign development. If I were doing this for a larger audience, the ratio of development time to play time quickly plummets — if six groups play the entire thing for about 300 hours, and it took me 300 hours to develop, there is a 6:1 return on my time (honestly less, since the GMs presumably would spend some time as well). Happily, I don’t need to invest all that time up front. Because of the segmentation of the megadungeon, I would only need to develop what appears to be imminently needed. I expect to complete the regional graphs (25 hours, as described above), and if it looks like they are headed to the Clockwork Hell I would develop only the nodes within that I would expect them to need. Given an afternoon I could probably detail two nodes to the ‘Detailed Development’ level, which could amount in 6-8 hours of play. If they push somewhere else I fall back on improv, then flesh it out for the next session. It would not be necessary to invest the total time described above, just to play with detailed information. As may be evident, fully developing a megadungeon is a lot of work, and can kill a fair number of trees when printed out. The application of the techniques I’m using breaks this work up into manageable chunks. At no point is the developer required to try to hold too much in his head. Instead, each region can be treated individually, referring to material from other regions as needed. Each region can have a distinct identity and feel, providing greater coherence to each, while still having connections to other regions. The transition between regions might be a little fuzzy, but when you enter the Dark God’s Altar with the unnatural dark purple lighting that makes you feel queasy, there is no question you’ve left Aristothanes’ Sanctum. The amount of time needed at any one point is not particularly large. The amount of creativity needed at any one point actually isn’t all that much — outlining Aristothanes’ Sanctum is likely to take much less time than Clockwork Hell did because I’ve got some good tables to work with, and I’ve got a really good idea what I’m going to do here anyway. I’m not populating “300 rooms”, nor am I populating even 30 rooms, only about 9 or 10 areas of interest. When I need to know more about an individual area (such as where he disassembles and studies constructs, or were he assembles and studies living creatures — many of which are consigned to the Pit of the Misshapen) I’m probably down to 3-5 rooms, at least one of which is likely to be pretty obvious, and at this level of detail the relationships don’t need to be particularly complex — a central room with some adjacent rooms would be sufficient. At any given time the amount of work is manageable, and the decisions needed are relatively simple. 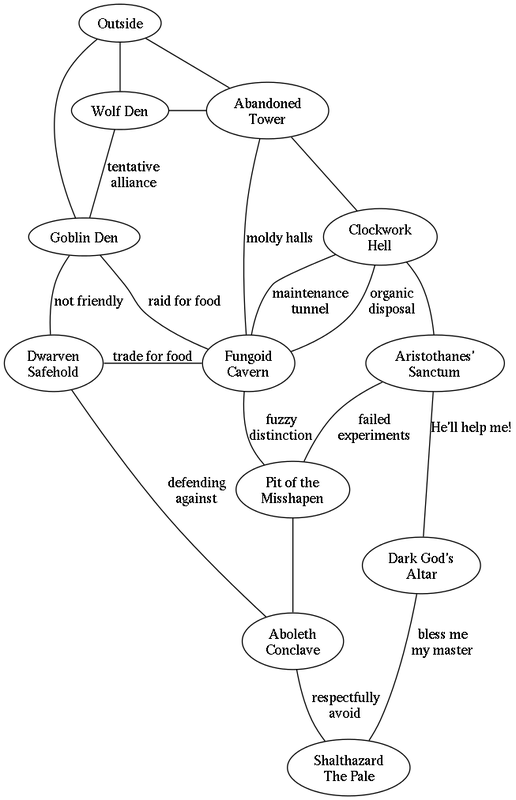 In fact, the hardest things I’ve had so far are coming up with names for things, and trying to get GraphViz to look exactly how I want rather than just provide me a diagram showing me the relationships that I can redraw if I want to. This reduces megadungeon development from an insurmountable work to a set of reasonably-sized chunks, while providing coherence to the result. The initial investment is fairly small for what you can gain from it, and even if you end up using the entire thing (which is unlikely) your time investment at any given point is relatively constrained because you can easily identify what is likely to be used and what isn’t, and you even likely have enough information to improv if the PCs do something you don’t expect. I don’t know how far I’m going to take this. I’m certainly going to finish the regional graphs, but after that, who knows? If there is sufficient interest (possibly monetary, I’m not likely to invest this much time in something I may not use myself) I might even finish it off. Or stop work after the regional graphs and people can do with them what they like. Pingback: Megadungeon Contest? | Keith Davies — In My Campaign - Keith's thoughts on RPG design and play.